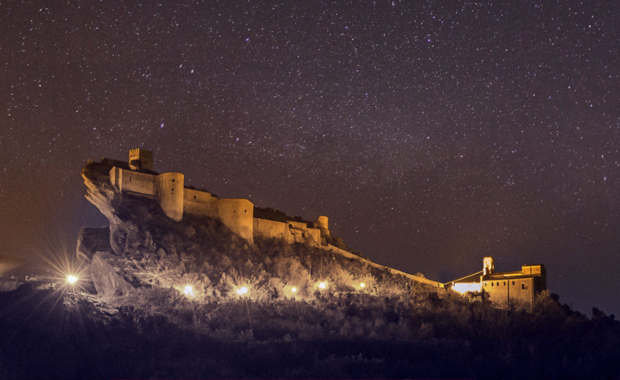 YAC – Young Architects Competitions – in cooperation with the Italian Government launches Observatory Houses, a competition of ideas to design a housing complex looking at the stars in the medieval fortress of Roccascalegna. An international jury panel gathering, among others, Enrique Sobejano, Rodrigo Duque Motta, Simon Frommenwiler, Pippo Ciorra will assess the submissions. A total amount of 20,000 Euro in money prize will be awarded. Dazzled by the brightness of our metropolis, we often forget the extraordinary vision the vault of heaven can offer us. However, there are still places that are far from lights and cities where the beauty of the infinite appears in its entire splendor. Surrounded by forests and crags, Roccascalegna is one of the places where this magic continues to occur and where the sky keeps on telling its eternal and beautiful story. It is a unique and far place that is both incredibly beautiful and clearly fragile. In fact, the fortress deeply depends on the constant care of the human being to preserve its characteristics and remarkable appearance. For the aforementioned reasons, the Rimini Fair and the Italian government launched the Observatory Houses project aiming to find a new use for Roccascalegna taking advantage of the potential of an oneiric setting with remarkable skies. The project aims at creating the first and most suggestive observatory houses in Italy. They will be a sustainable and exclusive house model aimed to ensure the protection and improvement of such inestimable heritage.